Lauren Purcell and Anne Purcell Grissinger grew up in the small-town South and moved to New York City together 15 years ago. They have been entertaining as a team ever since. Their signature cocktail parties marry style and sophistication with practical, do-it-yourself hospitality. In 1997, looking for something special to do for Lauren's birthday, the sisters created A Wine-Tasting Party Even Beer Drinkers Will Love, and the first of their foolproof Conversation Kick-Starters was born. 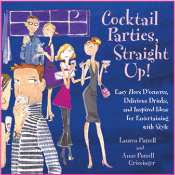 These stylish, sophisticated, supremely non-corny ways to get party guests to meet and mingle are in every chapter of their book Cocktail Parties, Straight Up!, along with the sisters' unique brand of down-to-earth entertaining advice. 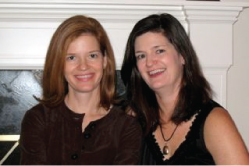 The Purcell Sisters continue to live and entertain in Manhattan, where Lauren is the executive editor of Self magazine and Anne, a former management consultant, is raising a family. They continue to write their e-newsletter, Sisters' Secrets to Confident Entertaining, and are developing a line of home goods. Have suggestions, questions or comments? Email us!